The broad band, upon which stand five skulls each adorned with a finial, is balanced on either side by two diametrically opposed fine plaits made from small bone pearls. The crown provides the base for a finely detailed floral decoration, and gold plated motifs in the round highlighted by blue and red semi-precious stones. 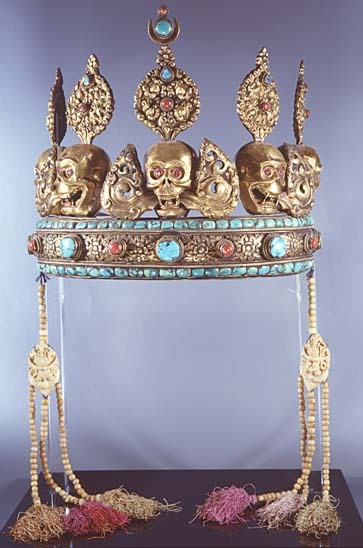 The five skulls, the eyes of which are featured by translucent red stones, are reminiscent of the five ornamental jinas found on the diadems of certain Nepalese and Tibetan Buddhist officiants. Highly virtuoso stylized flames issue from their half-open mouths. The pendants hooked on to the sides are made from animal bone, a detail which suggests that this diadem was used in a dGe-lugs-pa context, as the latter monastic order forbade the use of human bones in its rituals. Such diadems were worn by oracles in a trance during divination rites. They were not placed directly onto the officiant’s head, but sat on a padded cap. Although esoteric Buddhist rituals are varied and complex and involve the use of specific instruments, the basic formal typology of the latter is limited. These objects accompanied liturgical gestures, assisted in the preparation of divine offerings, or were related to exorcism rites.